Harry S. Truman, 1884-1972. 33rd President of the United States, 1945-1953. Very fine condition 8" x 10" black-and-white photograph boldly inscribed and signed, Kindest regards to / Alfred R. Boyd / Harry S. Truman. This is an official photograph of President Truman taken circa 1946 by the United States Army Signal Corps. It shows Truman reviewing papers while seated at his desk in the Oval Office. 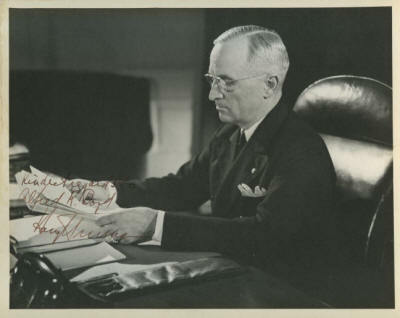 Truman almost assuredly signed this photograph as President. This photo is undated, and Truman dated virtually everything that he signed after he left the White House. This is a particularly nice copy mounted to a board and ready for framing. It has a few mounting traces on the white edges from prior framing, but the image is untouched and is absolutely stunning. 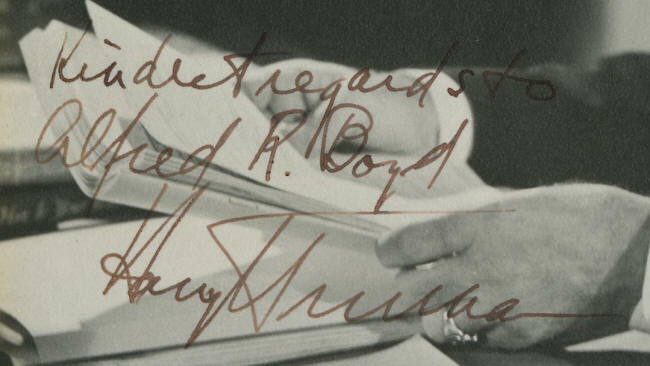 This photo bears a beautiful, bold 3" signature by Truman in brown fountain pen.